Shallow frying jackfruit is a very important step. Don’t skip that. 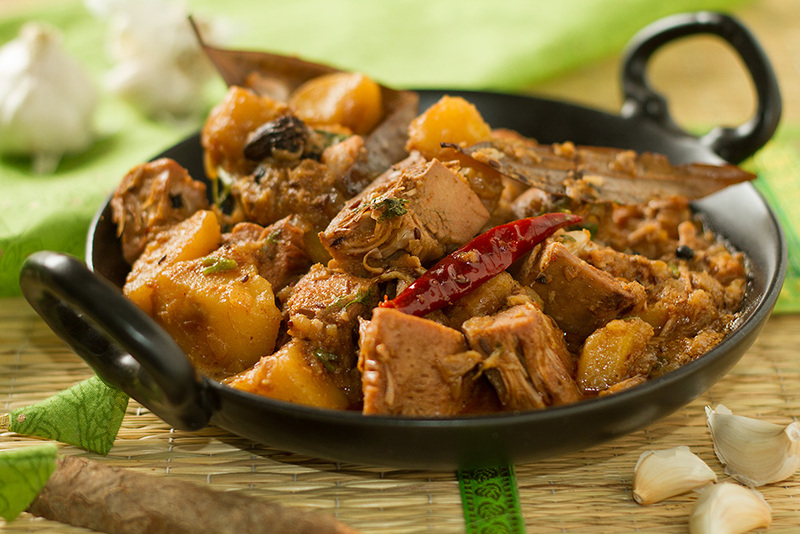 Potato is optional, but I like the taste of potato when it is cooked with jackfruit so I prefer adding it. The jackfruit (Artocarpus heterophyllus), also known as jack tree, jakfruit, or sometimes simply jack or jak is a species of tree in the mulberry and fig family (Moraceae). It is native to parts of South and Southeast Asia, and is believed to have originated in the southwestern rain forests of Indian Subcontinent, in present-day Goa, Kerala, Odisha, Tamil Nadu, Sri Lanka coastal Karnataka, and Maharashtra. The jackfruit tree is well suited to tropical lowlands, and its fruit is the largest tree-borne fruit, reaching as much as 35 kg (80 lb) in weight, 90 cm (35 in) in length, and 50 cm (20 in) in diameter. The jackfruit tree is a widely cultivated and popular food item throughout the tropical regions of the world. Jackfruit is the national fruit of Bangladesh, by name Kathal in Bengali language. The Jackfruit tree can produce about 100 to 200 fruits in a year. Source: Wikipedia. Make a fine paste of garlic and cinnamon and keep aside. Heat half the oil in a pressure pan and shallow fry katahal pieces and potato pieces separately. After they are well browned on all the sides, drain the extra oil back in the pan and keep the fried katahal aside. In the same pan, add the remaining oil and after it heats up, cumin seeds, add asafoetida, bay leaves, black cardamom pods (open them a little), cloves, dried red chillies and black peppercorns. Allow the khada masala to sputter and add onions. Fry till the onions are golden brown. Add coriander powder and red chili powder and fry for a few seconds, and then add the fried katahal to the pan. Add salt. Tip over the garlic cinnamon paste and fry the katahal, onion mix well, sprinkling water if the masalas stick to the bottom of the pan. Add sour curd or yoghurt and keep frying till the oil surfaces. After the vegetable appears well fried, add 1/2 cup of water, and close the lid of pressure pan. Reduce the flame after 1 whistle, and as soon as the pressure starts building up again (about 2 minutes), shut the stove. Open the lid after the pressure falls, taste for salt and garnish with fresh coriander leaves. Serve the Katahal ka dopyaza as main course accompanied with palak wali dal, roti and steamed rice.